By Kieran Conlon – Guideline Powerteam Ireland. Power Taper Triple-D’s, the original triple density line and in my opinion still the best. Triple D’s come in a very impressive range of densities from the full sinking to float sink versions. There’s a line for every situation & condition you are likely to encounter through-out the season. A great profile and density distribution makes these lines fly. A weight distribution that’s biased to the back of the head allows for effortless rod loading & D-loop formation. Floating and slower sinking rear sections depending on the head ensures bringing these lines to the surface is very easy making for less time roll casting and more time fishing. Add all these characteristics to a line that can be customised to your own requirements gives in my opinion the best combination of fishing & casting shooting head ever designed. If I could only use one type of head for my fishing it would be the Triple D range. For me the customisable aspect of these lines is key. A great characteristic of these lines is the fact that I can take 9/10 head and cut it back to say 31 grams to suit an 8/9 rod giving me a shorter easier to use line in tighter spots or when deep wading. Alternatively I can use the full length head for open waters and distance. Not only can I match the length of head to suit the environment in which I am fishing I can customise the head by length/weight to suit my casting style and tempo rather than adjusting my casting style and tempo to get the most from the line. This adaptability is great for casting consistency and ease of use and ensures that I can spend less time thinking about what the line is doing in the air and more time concentrating on what it’s doing in the water which lets face is where it needs to be. This customisation however requires us to be able to weigh and cut the line to suit or requirements and after which we need to be able to create a connection at the back of the head in order to loop the head to a running line. I know some anglers shy away from the Triple D’s for this reason and are fearful of not being able to create a strong enough or satisfactory connection. This need not be the case. 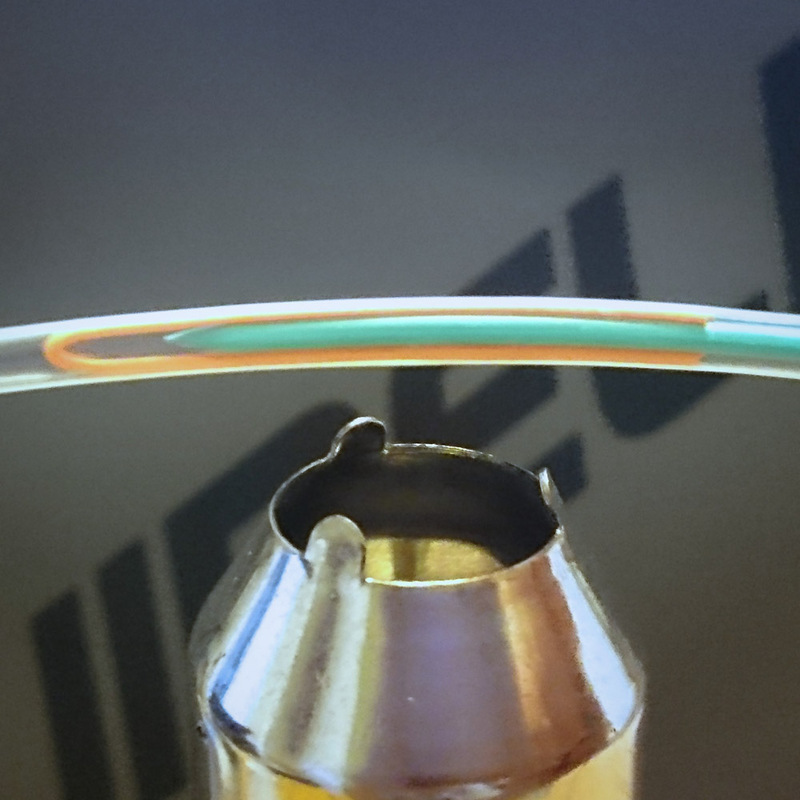 There are lots of options from braided loops, looping the exposed core which can be enhanced by a coat of aquasure etc and creating your own welded loop. This is the option that I prefer and have used since day one. 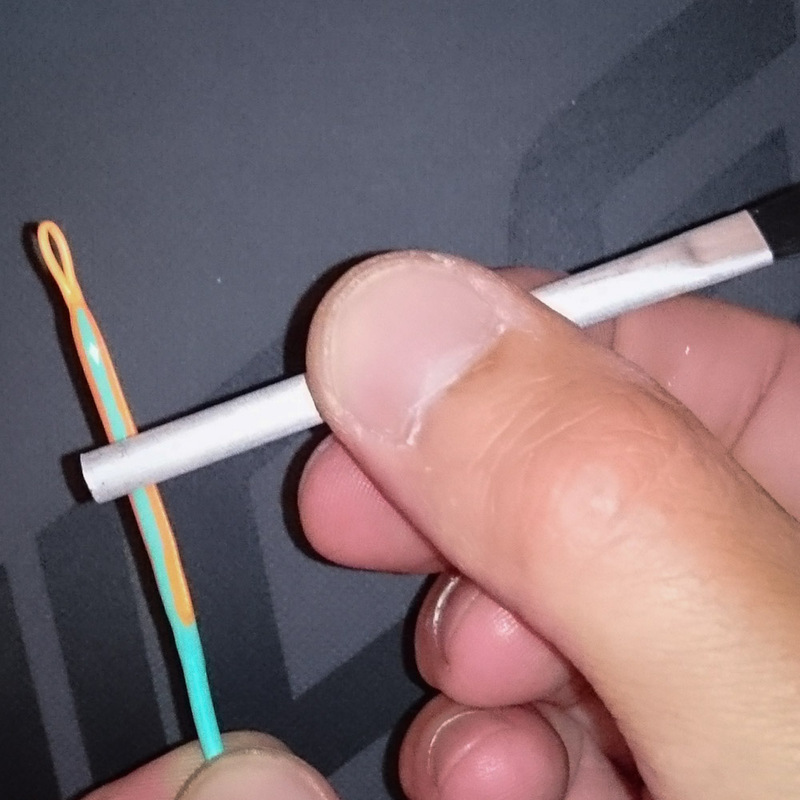 There are several methods of doing this and the following is the method that I have always used giving me neat small loops that form a strong loop to loop connection with the running line & glides smoothly through the rod guides. 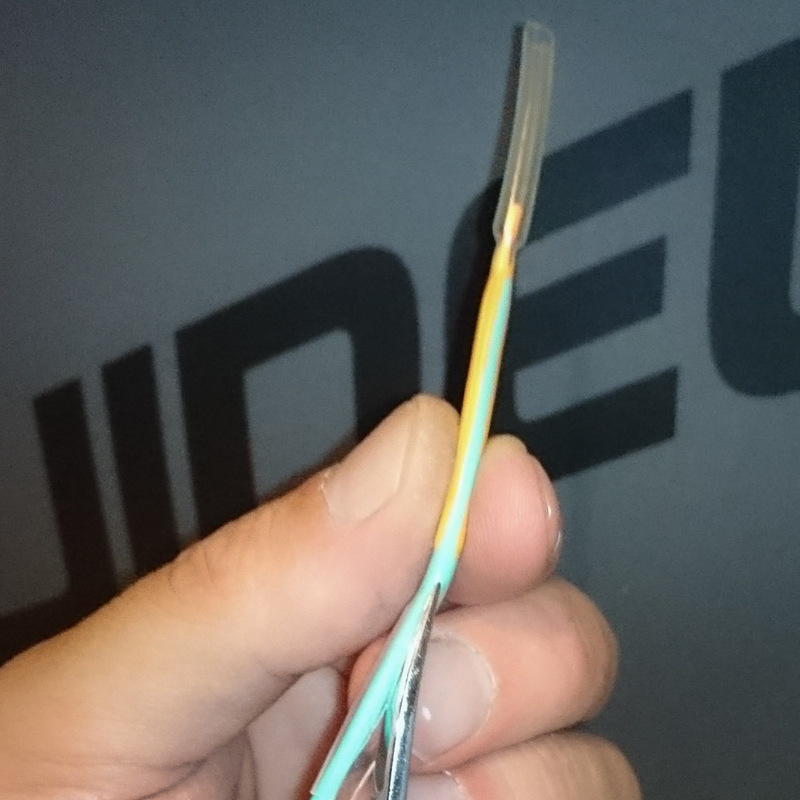 – Shrink-Tubing in 2.8 & 3.2mm (the larger diameter for the more buoyant lines such as the F/H/ I etc owing to there larger diameters. – Running line with which form the loops. Dacron core is essential as its more tolerant of the heat and braid helps to mesh/weld with the coating of the head. – Heat Gun – I use a dual temperature model that was actually designed for stripping paint but they are more reliable than some of the smaller gadget style models you come across and the heat is not prone to sudden fluctuations or running out of gas at inappropriate moments. I use the lower heat setting at 400 C. A concentrated nozzle is also essential in order to be able to apply the heat to required area only. Step 1. First and foremost we need to cut the head back to the required weight. This is done from the back of the head in small increments till you get the desired result. 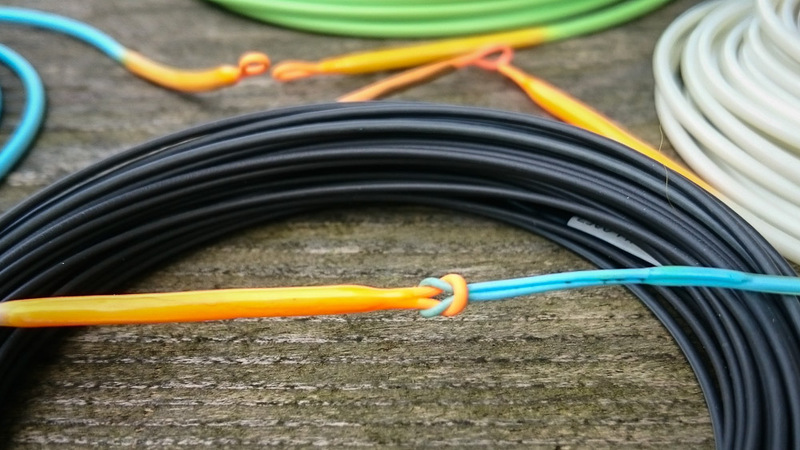 If you are new to these lines you will need to test cast as you go by making a temporary loop or knot by exposing the core of the shooting head. Once happy with the weight & casting performance we can start to make our welded loop. Step 2. Place a short piece of shrink tube over the end of the head and use the heat gun to apply heat and soften the coating allowing it to be rolled to a tapering point on a hard surface. This tapering effect is important to achieve a neat loop with a tapered neck. the required weld as it will be double over. Pinch it at one end to achieve a point. I find it easier to insert the doubled over running line into the shrink tube first and then insert the tapered end of the shooting head and position accordingly. 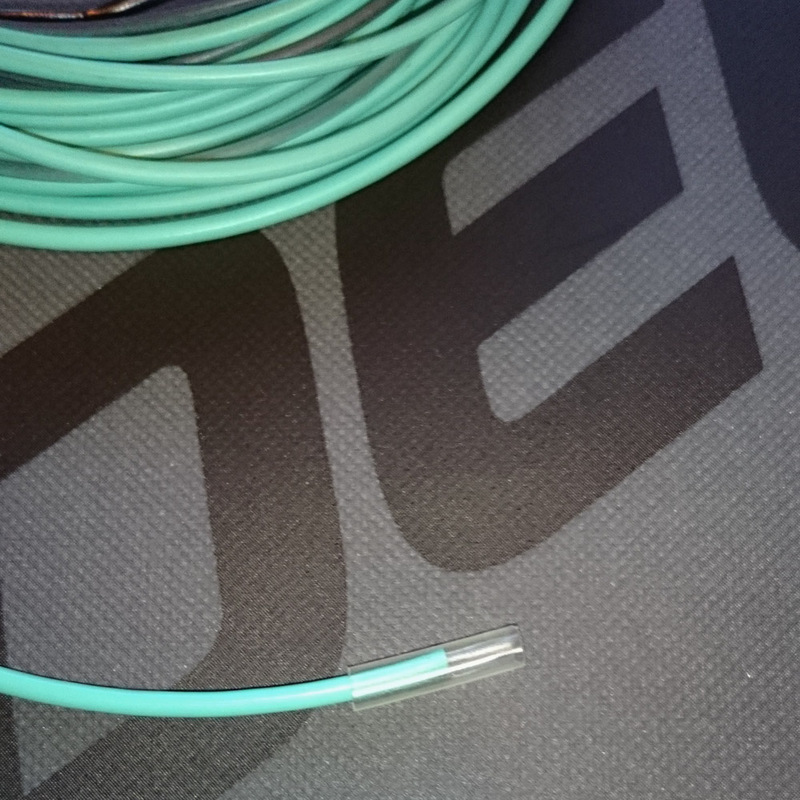 This is where you will determine the size of your loop. If doing this for the first time it may be necessary to give yourself and extra millimetre or two as a margin for error. Step 4. When everything is positioned correctly you can start to apply heat via the heat gun. Apply heat by having the heat gun stationary. I stand it up on a flat surface. Ensure there is nothing directly above or else…. Heat needs to be applied from 1-2mm beyond the open end of the loop to the tapered point of the shooting head. Depending on the length of of the area to be welded this may need to be done in one or two stages. After each stage roll the welded area on a hard surface prior to it cooling – watch the fingers here. This ensures a nice rounded smooth loop and also helps the coatings to bind. Step 5. Once satisfied with the weld and loop allow to cool for a few minutes, before carefully cutting away the shrink tube with a small pointed, sharp scissors. 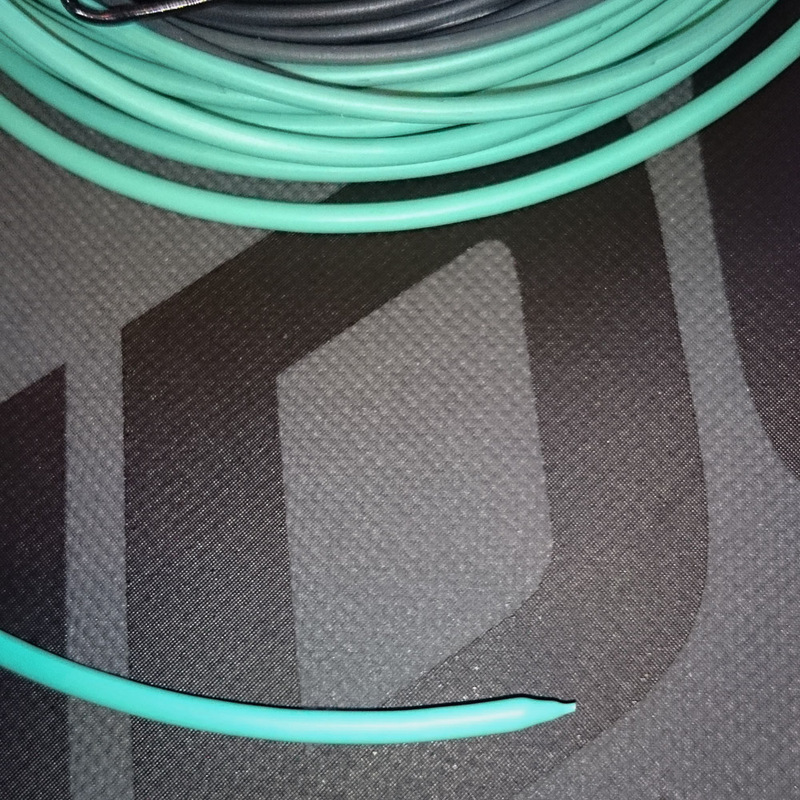 We should end up with a nice smooth loop with out lumps or bumps and a small neat low profile loop. Step 6. Now to apply a coating of Aquasure ensuring full coverage of the welded area right up to the neck of the loop. I use the back of the brush applicator to remove any excess. You only need a thin layer of the Aquasure. This allows the loop to remain reasonably supple, ensures the integrity and strength of the weld and gives a smooth finish. 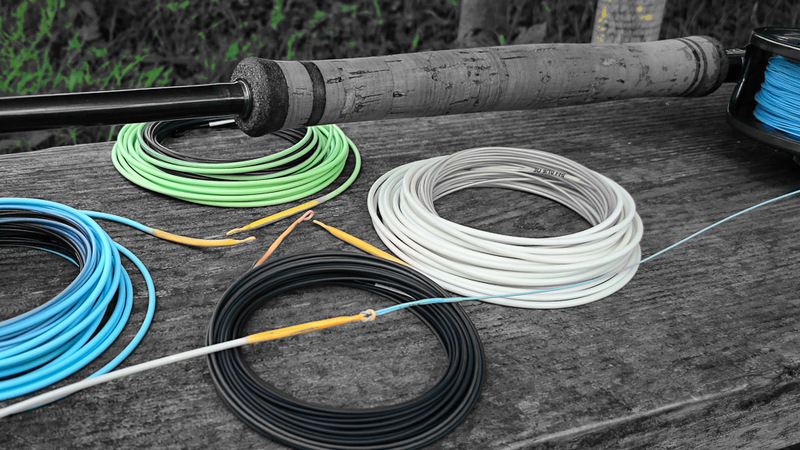 Allow the Aquasure to cure and the finished loop makes for a great loop to loop connection to any shooting line. A quick note on what we are trying to achieve here when I use the word weld. In essence we are trying to bond the coating of the shooting line(the loop) to the outer coating of the shooting head. 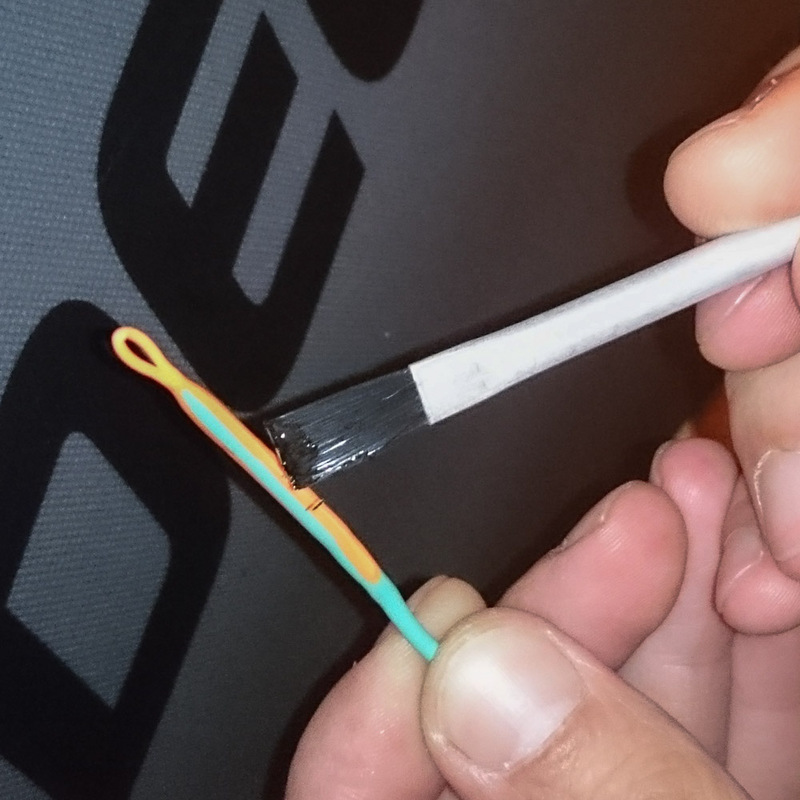 The Braided dacron core helps to grip and bind the to coatings in a similar fashion to the way a braided loop works. We then incase the weld in a thin coating of Aquasure and as anybody who has used it to repair waders knows it’s tough stuff. I have been using this method for a long time now and have never had any of these loops fail either in a fish or when snagged, even to the point of straightening very strong double tube hooks when snagged up at distance. Like everything in fly fishing you need to have confidence in every aspect of your gear and while knots and connections tend to be a personal thing I would have every confidence in recommending this method to anyone. Triple D’s are a great line and one I would not be without. This method of welding loops is simple and effective and should allow anyone to take of advantage of some of the great and unique density combinations in the range. 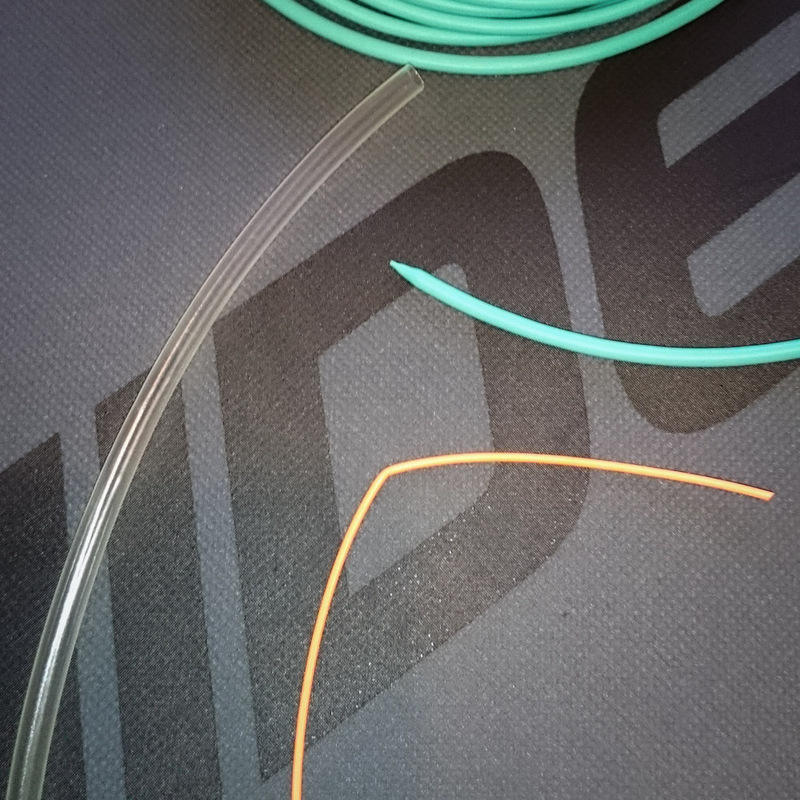 It’s stronger if the Aqua sure is put onto the line before the shrink tube goes on & makes a nice neat job too. 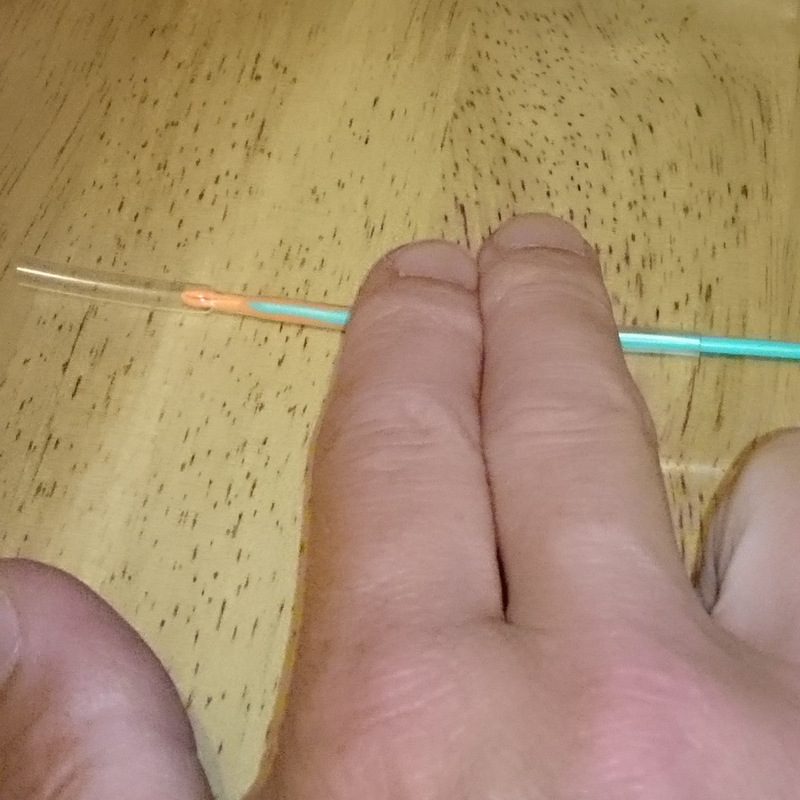 As the shrink tube closes the warmed aqua sure capillaries to fill the sleeve. The shrink tube can even be removed afterwards if you wish, but I just leave it on. I have found that the softest shrink tube is that from CPC FARNELL. And it’s about £2.60 for 100 meters.